Well, despite all the trials and tribulations of colic/acid reflux/whatever it is that troubles her much of the time, our little girl is thriving and growing - and even smiling! We have good days and we have bad days, and smiles like these make the bad days infinitely more bearable. 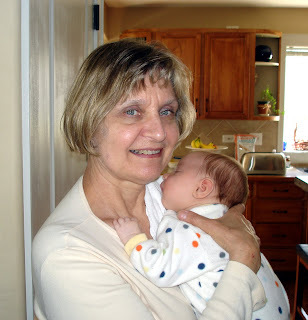 Last but not least, a photo of Linnea doing what she has basically been doing most all week long - napping on Nana. A huge THANK YOU to our wonderful families who have swooped in to support us through these last loooong weeks - Gramma & Grampa, Nana, Aunt Aimee, Aunt Nanci/Uncle Andrew/Cousins Kelsey & Evan have all come to lend a hand, as well as friends and church family members, and we are more grateful than we can ever express. Apologies once again for the long lag between posts... this time, the excuse is actually legitimate. For those of you who haven't heard, we've had a rough last few weeks here. 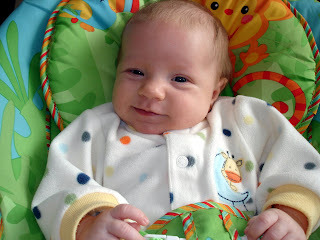 Shortly after our last post, Linnea was diagnosed with colic. Shortly thereafter, as the symptoms seemed to be increasing and pointing to more than just standard colic, we began treatment for acid reflux. At this point, we are honestly not sure what the issue is (could be either or both). All we know is that our little girl has been miserable these last few weeks and it has been painful for all of us. 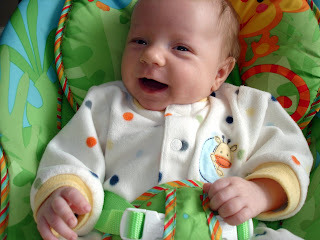 We go back to the pediatrician on Tuesday the 8th for a re-check to see if the acid reflux medicine is working or not. Please pray with us that it is/does so that Linnea can have some relief - and we all could get some rest! Apologies also for the lack of a photo with this one. Things haven't exactly been "picture perfect" as of late, but we hope to get back into the picture-taking business soon. Please stay tuned!